Germans' reverence for the written world is well documented. German authors have received the Nobel Prize in Literature thirteen times, making Germany one of the top 5 holders of the prize in the world. Johann Wolfgang von Goethe — poet, writer, and playwright — was one of the country's first public intellectuals and is still one of the most well-known authors today. The Brothers Grimm are architects of children's imagination - over 150 years after their death. So it is no surprise that Germany has some of the most impressive libraries in the world. From baroque to ultra-modern, these libraries are a site in themselves and world-class attractions. Take a tour of Germany's most beautiful and unique libraries. Metten Abbey has many names: St. Michael's Abbey at Metten, Benediktinerabtei Metten, Abtei Metten as well as Kloster Metten. Founded in 766 in Bavaria, it is located in the dreamy area between the Bavarian Forest and the Danube. Though its location is firmly on the ground, its library looks like it dropped straight from heaven. Opened in 1726, the interior holds a elegant ballroom from 1734, a refectory (dining room) with modern stained glass windows, a ceiling fresco from 1755 and the legendary baroque library. The monastery underwent an array of changes before being secularized in 1803, then becoming a monastery again by 1830. Visitors enter beneath the allegorical figures of wisdom and religion looming from the ceiling. Its elaborate stucco decor and massive bookshelves hold 35,000 volumes. Of particular importance is the Mettener Antiphonar from 1437 with the lyrics and melodies of all songs of the breviary. There is also a modern library available to the everyday reader. Visitors can gawk at this incredible library during a guided tour by the brethren. Note that photography is verboten (forbidden). Once located in Wilhelmspalais — an actual palace — in the center of Stuttgart, it's hard to believe any change could be an upgrade. But this library's 2011 move to an ultra-modern building has proved popular with locals and library fans alike. The construction budget added up to nearly 80 million euros and it shows in its austere design. It was selected from an architectural competition with South Korean Eun Young Yi emerging as the winner. The library's stunning look has proved popular with pictures circling the globe and by winning the 2013 library of the year. Formally known as the Stadtbibliothek am Mailänder Platz, it is a massive cathedral to the written word. The outside features a double façade of embossed glass building blocks with slats that can slide to prevent glare and a solar power glass roof. For visitors, the double façade means there is a wrap-around balcony with breath-taking views of the city, as well as a rooftop terrace. The floor area is ​​20,200 m² holds a total of 500,000 media units. The library is formatted as a cuboid with an empty central section called the "Heart". There are several floors underground and five stories rising up 40 meters. Special features include a sound studio, music section with LPs, notation software and software for scanning sheet music plus musical instruments, children's floor, library for insomniacs (cubby system open 24 hours), art lending library, and an online animation library. At the top, charity-run Café LesBar provides refreshments for the body once the mind is sated. 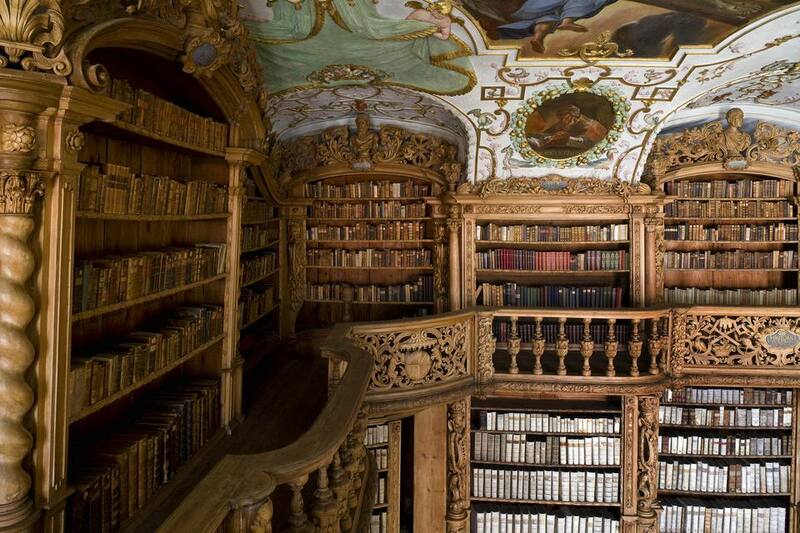 Stiftungsbibliothek Waldsassen, located in a Cistercian Abbey, is one of the most important art libraries in Bavaria. Its construction began in 1433 and it has continued to transform while retaining its old-world allure with nearly 100,000 visitors every year. Four large frescoes depict scenes from the life of Cistercian saint, Bernard of Clairvaux, with the vault of the library covered in intricate stucco design. Along with the masterful frescoes, there are massive wood carvings such as the ten life-size figures supporting the heavy ceiling of the hall. The figures symbolize the different facets of pride, like stupidity, hypocrisy and ignorance. In contrast to these negative features, pillars of intelligence like Plato, Nero, and Socrates elevate the room. Founded in what was Belgium in 1093, this monastery library in Maria Laach is one of the best preserved and most beautiful libraries of the 19th century. That said, it did undergo a traumatic transformation when the abbey of Maria Laach was abolished in 1802. The library was dismantled along with the existing book stock, about 3,700 volumes. In 1892, the Benedictine monks resettled the monastery and re-stocked the library. About 69 manuscripts from this library can be found in other places in Germany and beyond, with only two manuscripts returned to their original home. Today, the library has 260,000 volumes in the new reading room with about 9,000 printed before 1800. The oldest section is in the Jesuit Library with rare books kept in a renovated cowshed with climate control. It is now one of the largest private libraries in Germany. The library also was entangled in controversy surrounding the Nazi regime as rumors swirled that the monks actively and voluntarily collaborated with the Nazis. This was depicted in Heinrich Böll's Billiards at Half-past Nine. The library is closed to general opening hours, but is open with prior registration. If you just want access to its resources, two-thirds of its stock is available online. In typical Berlin fashion, its most beautiful library is free, charming, and community oriented. Located on a corner near trendy Kollwitzplatz in Prenzlauer Berg, many people pass by without even realizing this "tree" is different from the others. The Bücherwald (book forest) is actually multiple logs bolted together, featuring shelves of random books available to the public. It is the first environmentally-friendly and publicly accessible bookshelf in the city, although it was proceeded by a similar project in Bonn. Opened in June 2008, this unique and free lending library was created by BAUFACHFRAU Berlin eV, an educational institution for women working in the building industry. The trees were collected from Grünewald, a leafy forest in the west, in a way that adheres to sustainable forest management. The library can hold up to 100 volumes, mostly in German and English, from serious literature to children's books. While some books enjoy a long stay in their urban forest home, others have crossed oceans and only stop in for bit. All of the books can be tracked through the bookcrossing site, following their fascinating journeys not just within their pages, but the history of the book itself. To participate in this community project, simply take a book or leave one behind. Oberlausitzische Bibliothek der Wissenschaften includes 140,000 volumes and is a public scientific library located near Dresden in the historic city of Görlitz. It was founded by historian and linguist Karl Gottlob Anton and landowner Adolph Traugott von Gersdorf to support the ideas of the Enlightenment. It holds materials ranging from legal texts to natural sciences to historical literature. Originally, only members of the their society could access the collection. But today the collection is open to the public and sightseers who simply want to enjoy a beautiful library. Housed in a baroque building, the collection includes 14,000 years of regional history. For example, it holds historical maps, archives of the Upper Lusatian Society of Sciences, archaeological collection of ancient pottery, as well as the life's work of poet and composer Leopold Schefer. While the materials cover modern texts to ancient works, almost all of the materials have been digitized and are available online for research and use, free of charge.